Marketing Elements by Timothy Goleman - Instagram Vs. Snap Chat – Which should you be on? Instagram Vs. Snap Chat – Which should you be on? 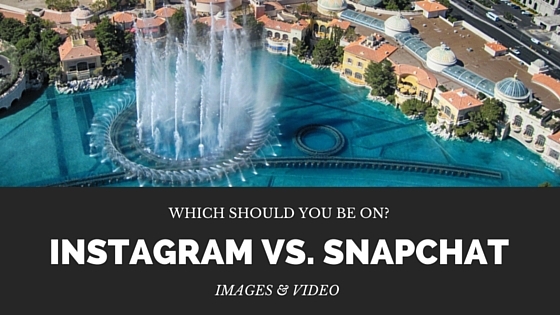 Instagram and Snapchat are similar services. Both involve images and videos. However, there is one big difference. On Instagram pictures stay and on Snapchat they disappear after viewing, or if a story a day. So which of these services should you be on for your marketing? If I was giving advice to a client I would definitely suggest Instagram. It’s not that I have anything against Snapchat. I prefer to have things stick around rather than disappear after a day. Sometimes you work really hard on a campaign and you want it to sick around longer. Also, have your fans be able to look back as well. 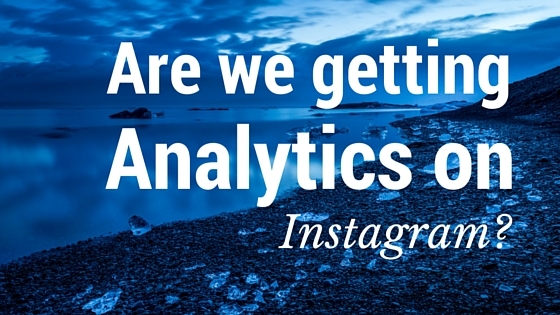 In a recent study by L2 Think Tank said that more brands have embraced Instagram. Most of the ones listed above are 90%+ adoption rate. 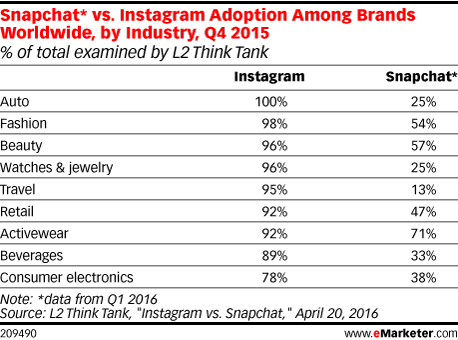 Snapchat has 30-50% adoption rate. The reason before this? I think Instagram is easier to use. There isn’t a learning curve. You take a picture, you post a picture and bam, you’re done. In Snapchat you can post a picture or create a story. 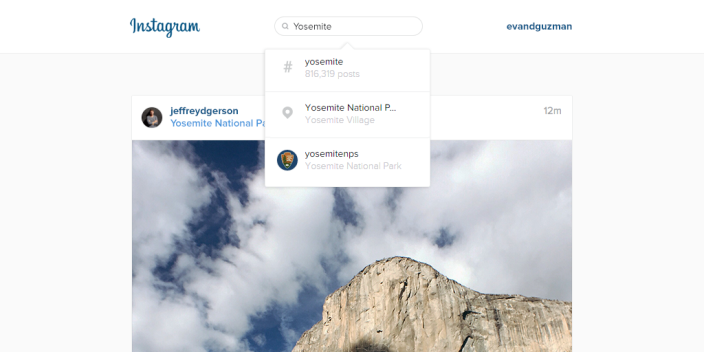 Its not as intuitive as Instagram. This is the biggest draw back for Snapchat by non-tech or social people. Many people I have talked to just don’t get it or how to work it. One of my biggest gripes is there needs to be a way for a brand to be able to upload pictures from the app. I have heard rumors that if you’re a brand partner with Snapchat you get extra tools. If you’re a small brand you have to take pictures through out your event. If you’re anything like me sometimes you get super busy and forget to get a picture. If someone else on your team got it there is no way to put it in the story you want to post. 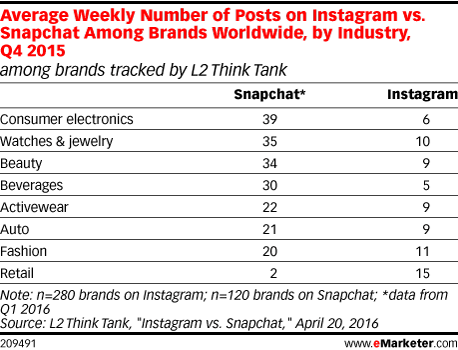 One more thing to take into consideration is that Snapchat has much higher per week posting. My initial thought on this is that since the picture doesn’t save you need to be sending out snaps on a regular basis to stay top of mind. I am by no means an expert in Snapchat. I use it for personal but haven’t used it for a client yet. Which Should you be on? Even with the new curated feed on Instagram and pending brand profiles. I would say if you’re venturing in the world of visual social that your first step be Instagram. If you’re in Technology or other Activewear you definitely should be on both. Just note that there is a bigger learning curve with Snapchat and it will take more effort master the network. Also, things will need to be done in real time. If you don’t do a lot of events or pictures. Snapchat will not be for you. And remember content is King! 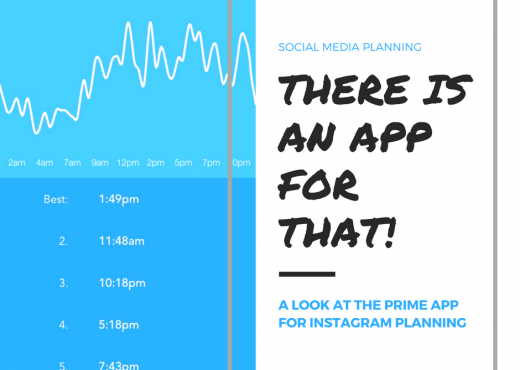 Need Help Scheduling Instagram… There’s an App for that!